When your sales team is not performing up to your expectations, you might think: “I failed to hire the right people.” But what if that’s not it? What if they aren’t motivated because they don’t have the right objectives, tools or coaching? What if you could do something to make your team more effective? Let’s face it: Your sales team is under a lot of pressure. They have a lot of weight on their shoulders, and it’s essential for that you to invest in them with training and motivational techniques, and because if you do, you’ll see results in their achievements. 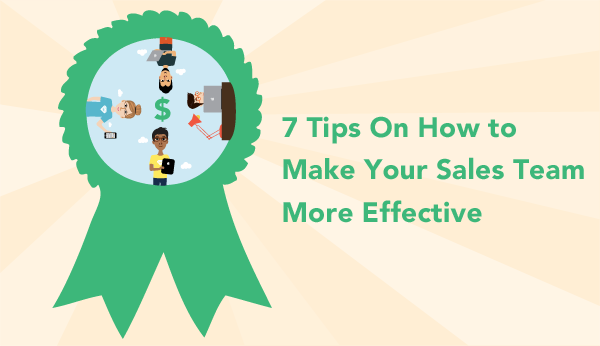 Let’s go through 7 tips that will lead to greater effectiveness in your sales team. Clarifying the sales objectives is the first thing you should do. Then, break them down into the individual goals that the team members should meet. Don’t focus solely on the sales. Measure other things like the number of calls, emails, and meetings of each team member. Next, create weekly charts, which will show the activity of each sales representative towards the goal and make sure the charts are visible to the entire team. Give your team the ability to see how each person navigates through the sales funnel and let them diagnose how things are progressing Good salespeople are competitive and are always looking for ways to get an edge. If they notice that someone who’s sending more emails is making more sales, they will adopt that tactic. A small dose of competitive spirit goes a long way. Your CRM system gives you tons of data to measure. Does everyone in your team know how to use that data? Whenever they are making a sales offer, they must take a client’s past behaviour into consideration. The Capturing, and then using this data gives them details that help them close the deal. They should also measure the effort they need to convince an average customer to make the purchase. It’s not advanced math! Calculate the number of calls, meetings, and emails they usually need to close the deal. That will help them know when to push things forward with a potential client and when to move onto a new opportunity.give up on them. You have a mission for your business, right? Is every single member of the sales team aware of that mission? Do they care for it? I for one believe that to be an effective salesperson, you need to believe in what you’re selling. To ensure your mission is clear, first, the sales representatives must understand your business niche. What makes you different from the competition? What’s your highlight? What’s the purpose of your organization? When they have these details in mind, the sales process will be driven by them. They will convey the company’s vision, and they will convince the customer that this is a valuable offer. First of all, you need a tool that will connect the team. The first thought you have is: email should be enough for that, right? Well, it’s not enough. No one likes digging through the messages to find the exact piece of info they need. Plus, inboxes are filled with promotional messages on a daily basis, so your messages may go unnoticed. You need a sales tracking tool such as Daylite. It will keep everyone informed about the progress of a sale and important due dates they should have in mind. Also, it will keep all the information your team members have about their clients in a single place. They can access the email messages, call notes, and details regarding appointments. Culture Is Just as Important as Strategy. Nurture It! Effective sales management is not achieved solely through a grand strategy. Culture is just as important! Each team needs precise goals and measurable data. However, you’ll push them towards those goals more effectively if you make them feel inspired to go to work every day. What’s the culture of your company? How does your team convey that culture? You can make them feel closer to the values of your brand if you organize lunches, parties, and team building events. Invest in a blog, too! Provide useful articles that help your sales representatives deal with different challenges and find the balance between work and family. If you don’t have time to write articles, you can outsource that task to a service like Rush My Essay. Top-performing businesses invest in the professional development of their sales representatives. Through these training sessions, each team member improves their skills and strategies but also finds inspiration to do what they do. Organize effective training and development programs at least twice per year. In addition to professional training, you should also offer personal development sessions along the way. You can hire a yoga teacher for guided exercise and meditation, which will help your sales representatives stay focused and relaxed. Every single member of your team has their strengths and weaknesses. They gain universal benefits from the training sessions, but they also need individual attention. It’s important for a business owner to analyze the performance of each worker and figure out how they can become better. If, for example, someone doesn’t use the project management tool that effectively, you can offer one-on-one instructions. Your sales team members want to be better. Not just because more sales mean a greater salary for them, but also because they want to get results from their efforts. You can increase their effectiveness when you understand their needs and provide adequate support. Hopefully, with these 7 tips will get you there sooner rather than later. Brandon Stanley is a professional independent journalist. He is interested in writing articles concerning management and teambuilding. Apart from that, Brandon loves traveling and playing the piano. Follow him on Facebook and Twitter.